Sure, SM and I are together now, (well, in the same city at least…living together only comes post-marriage in big Fat Pakistani fashion) but once upon a time this was not always so. For three long years we dated via long distance ( London, England to Toronto, Canada) and I think it made us the solid pair that we are today. –Facebook. Use Facebook to create “private albums” that only the two of you can share and comment on (but please, double, triple check the privacy settings -no one wants to stumble upon an album full of comments of you lamenting on your love! ); Send each other random messages (a little red mail flag notification can be awfully exciting); Share inside jokes on each other’s walls….as minor as they may seem, it’s really these little things that bring a smile to you and your partner’s face in the absence of you being able to do so in real life. –Skype. The long distance lovers haven. Free voice and video chat. How else do you have online dates where you watch the same movie together? –Apple. Ah, yes, I-phone will help U-love (get it? The “I” and then the “u” …hehe sigh) FaceTime is fun, I message is free and the app viber just makes long distance calling so easy! Now as key of a role that technology plays, there’s something to be said for good ol’ fashioned snail mail. Who sends hand written letters these days? No one. So if fate has it that you must be miles apart from your lover, then make the most of the situation by infusing in it some old-school romance. The excitement of actually receiving a letter, card, parcel or care package sent by your special sometime who is so far away, brings with it a joy unparalleled to receiving an email or text. It’s the next best thing to a hug when all you really want is a real one. So we’ve covered correspondence, but then there are the actual trips in between that if you can make happen are what keeps you going. It’s what you constantly look forward to and what you constantly reminisce over afterwards. So, make airlines and airline websites staples in your daily web-browsing habits. My favorite site was TripAdvisor – I always found that they had the lowest rates. Always via AirTransat – so much cheaper than Air Canada! And make sure you get a good credit card to accumulate travel points – how they will come in handy! The final tip that I would give is: be creative. For example, one time SM created a valentines day date where he sent me the link to a playlist of love songs he had assembled on YouTube, a link to an art gallery we were going to peruse (google art project where you could see museums around the world), a link to a Bollywood movie he had streamed, and then mid way through our Skype chat asked me if I was hungry (yes, naturally). He instructed me to go downstairs and open my front door…I do and there I find a Pizza Hut pizza and a heart shape box containing Ladoos. I return to the laptop happily with food in hand, and a look of wonder, and SM simply says: it’s not valentines day without dinner”. Yeah, SM is good. (Shout out to SM’s best friend). I say all this with the recognition that SM and I started off doing long distance, fully committed to the reality of our decision and situation. 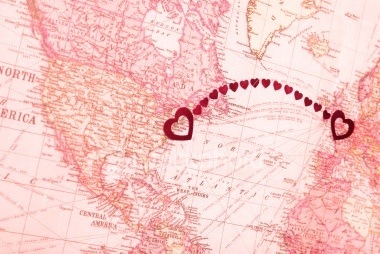 It would be a lot harder to go from dating in the same city or living together to having up do a LDR! That said, if both parties are committed you can totally make it work and its definitely worth it in the end! Hi Sabrina! Aw thank you, and yes if both people are committed (and supportive families obviously help!) They really can! Totally happy to share: I met SM after my undergrad, while I was doing my Masters, he was in his 1st year of law school at the time and so we did LD for another 2 years from Toronto – London after that! I’m assuming you’re going through a similar sit! ?